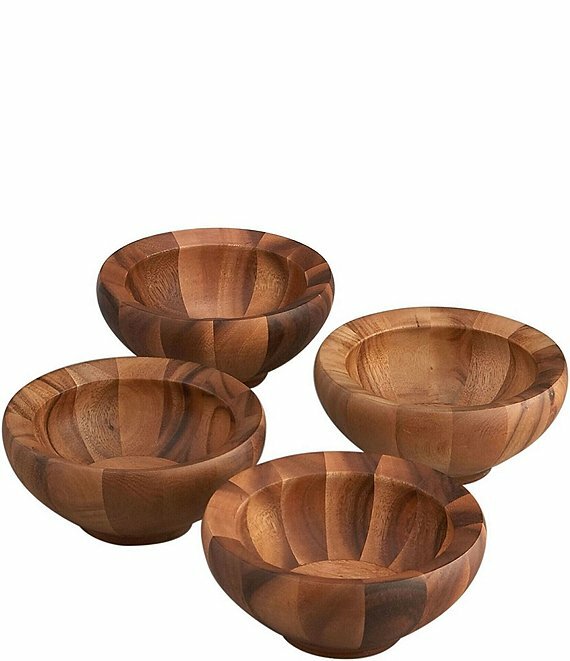 These salad bowls from Yaro are made of acacia wood, a dense, durable hardwood that glows with warmth and enthralls with finely patterned grain of varying shades. Designer Sean O'Hara places each bowl in this set of four on a narrow pedestal and flares the sides roundly up to a wide mouth. Naturally resinous, acacia wood will not absorb stains or odors, and the bowls can be hand washed with warm soapy water. The perfect complement to these individual bowls is our identically shaped Yaro Salad Bowl with servers. Approx. 3.75" diameter. Imported.